HoloLens, Oculus Rift and now Valve?! Microsoft's Kudo Tsunado took to the stage to discuss the recent news about Xbox One streaming to the Oculus Rift. Then he dropped the bombshell that the company is also teaming up with Valve VR and presumably working the same Microsoft magic with the HTC Vive. Unfortunately nothing else was mentioned about the new VR trifecta but we're sensing more streaming features in the future between the console and the head mounted displays. 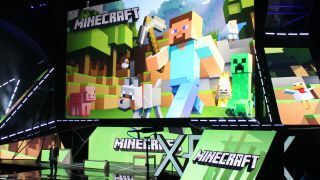 A new version of Minecraft has also been build specifically for the HoloLens. The game was demoed on stage showing off how a person sporting the augmented reality headset was able to play with another person who was on a laptop. Pinching and zooming in plus lifting up the entire world to view the cubes underneath all right in front of you made it look like a miner's dream come true. You can also lean in to get up close and personal with the little structures for a better view.